Thousands of Easter lilies symbolizing the Resurrection were part of Sunday’s celebrations and most will be relegated to the rubbish bin, discarded as useless. However since the flowering lily springs from a bulb these lilies may be easily integrated into the garden and provide beauty for many years to come. Lilies usually bloom in summer but were ‘forced’ to bloom early for Easter so do not expect any more flowering until next year… the bulb needs to rest. *Forcing is a process to make the bulbs bloom prematurely; they believe it is the ‘right time’ to bloom months ahead of their natural schedule. The lily enjoys sun on her head but a coolness about her feet, so pick a sunny place in the garden and tuck the bulb amongst other guests or put several stones at the base. Also driving winds or extreme heat may adversely affect the lily so pick a site with some afternoon shelter and dappled shade. As you pull your lily from the pot, you may notice the extreme root growth that has occurred from being in greenhouse conditions. If the roots are tightly bound in a circular pattern, the lily was grown in too small a pot and is ‘root bound’. The roots must be loosened and spread out to allow the poor thing to grow without strangling itself. Gently loosen the roots and it will not harm the bulb if some break or are cut a bit. Dig a hole that is twice the width of the root ball and five or six inches deeper. Work some potting soil into it and then plant your lily, spreading the newly loosened roots down and out. Often there will be three bulbs in a standard Easter lily pot so carefully divide them and plan on planting them six or seven inches apart. Fill the hole with soil, and water while working your hands in the mush. Jiggle and wiggle the plant while looking for air bubbles to surface and when no more appear, there are no hidden pockets to cause rot. Once the water level has receded, lightly water once again and add a bit of soil if it seems to have sunken at all. Cut off the wilting flowers, but wait to cut back the foliage until it appears yellow; the foliage will nourish the bulb and help store energy for flowers next year. The unforced flowers will appear on time... in the early summer when the lily normally blooms. 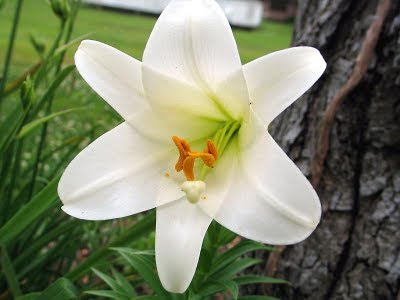 Your lily will live for many years, reminding you of the joyous occasion when it was introduced as a guest at an Easter gathering.